Whenever you dine with us at The Desmond, you’re experiencing the handiwork of executive chef Chris Calhoun and our talented kitchen staff. Chef Chris brings culinary creativity and a level of execution that only experience can produce to every item on our menus. We caught up with Chef Chris to hear more about how he brings award-winning cuisine to each of our restaurants. As Chef Chris put it, “The overriding factor is to source food that’s as untouched as possible. Whether it be whole fish or whole cuts of meat … we want it pass through as few hands as possible before it gets to our kitchen.” This ensures fresher ingredients by limiting the amount of travel and storage that the food experiences, which can impact quality. “Especially with meat, air is important, and so is temperature,” he added. Here again, careful sourcing and meticulous handling at the restaurant are key. “Take oysters, for example. They can only survive in one orientation. They should be packed that way,” Chef Chris explained. With him at the helm, every important measure is taken. “We get seafood deliveries four to five times a week. It’s common for other restaurants to get them maybe twice. The benefit is high quality,” he said. We work with Mattes Seafood, which gives us access to amazing quality seafood selections as they come in season. Among Chef Chris’ favorites are line-caught black sea bass, bay scallops and whole Maine lobster. 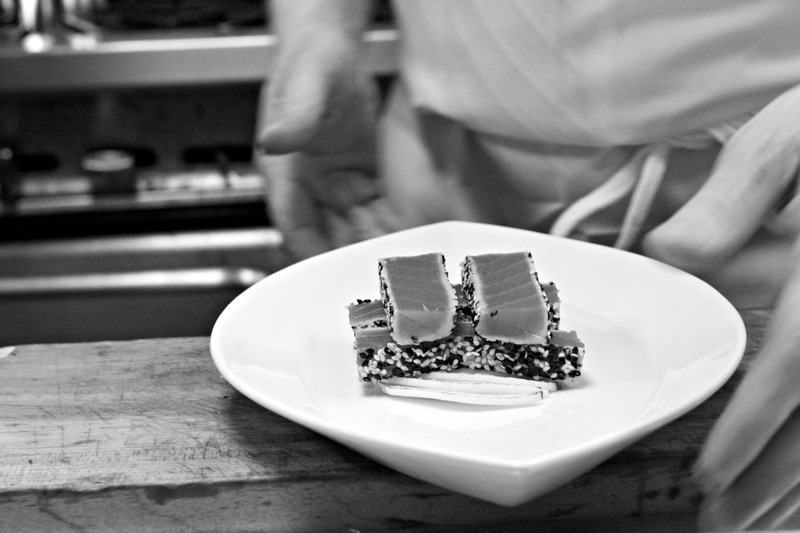 “It is very important to have a strong relationship with our purveyors,” Chef Chris related. “I like to talk to someone when I’m ordering.” Having close relationships allows us to successfully source the perfect ingredients for every dish on the menu. It also gives us access to select—and highly seasonal—products that can be hard to find and procure. “Sometimes you order the same thing from seven different people until you find the one that will offer the consistent quality you’re looking for,” Chef Chris added. Once that gem of consistency is found, it sparks a relationship. We work with a number of wonderful purveyors including Evergreen Lane Farm, Subarashii Kudamono Gourmet Asian Pears, Manicaretti (for Rustichella d’Abruzzo pasta) and FarmArt Produce. One of Chef Chris’ favorites: locally grown Asian pears from Subarashii Kudamono. “They’re the best Asian pears I’ve ever tasted,” he said. “I’m a big proponent of fruit. I’m not saying I want to replace vegetables with fruit on the plate, but I often do.” The effect is something delightfully different that helps set his cuisine apart. The menus at our restaurants feature a diverse array of carefully procured ingredients. “One of the beauties of food now is the variety. I love using local honey, but there are also honeys from around the world that are amazing,” Chef Chris noted. Focusing on the best as the bottom line means that we can offer the finest seasonal foods from Pennsylvania and abroad. Our plates might feature wild caught salmon from Alaska alongside locally grown fruits or vegetables. The end result is a collection of menus for each restaurant that are enticing, modern and broad enough to please any palate. There’s something extra special about all of our dishes at The Desmond—it’s the kitchen’s attention to detail that makes for a revelatory dining experience. That means a lot of work in house. We get whole product straight from the purveyor and break it down in the kitchen so no crucial steps are missed. “How was the animal raised? Was it fed a proper diet? Was it harvested humanely? We cut all of our own black angus tenderloins in house. It’s a tremendous amount of work. When you put all this effort into one component of a dish, it shows,” Chef Chris remarked. “The same is true for picking out what wine you’re cooking with. How do you cut your shallots? 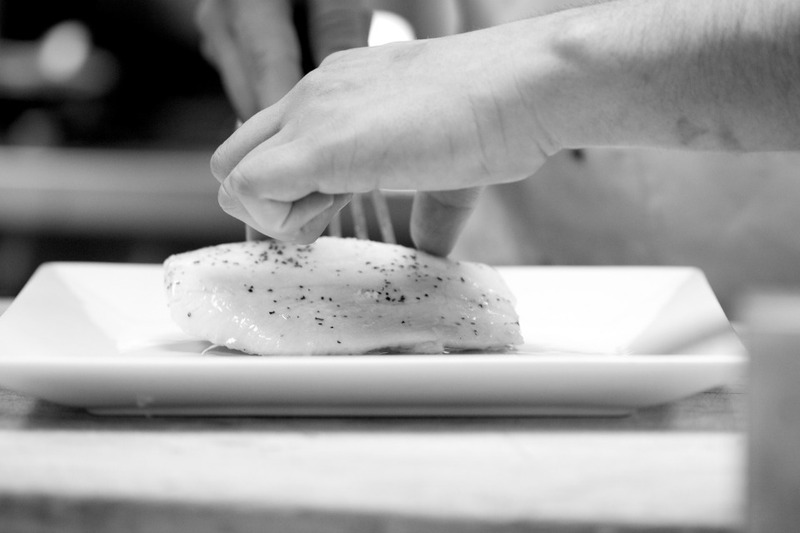 Did you peel them in house?” Chef Chris’ eye to detail elevates every plate that leaves the kitchen. 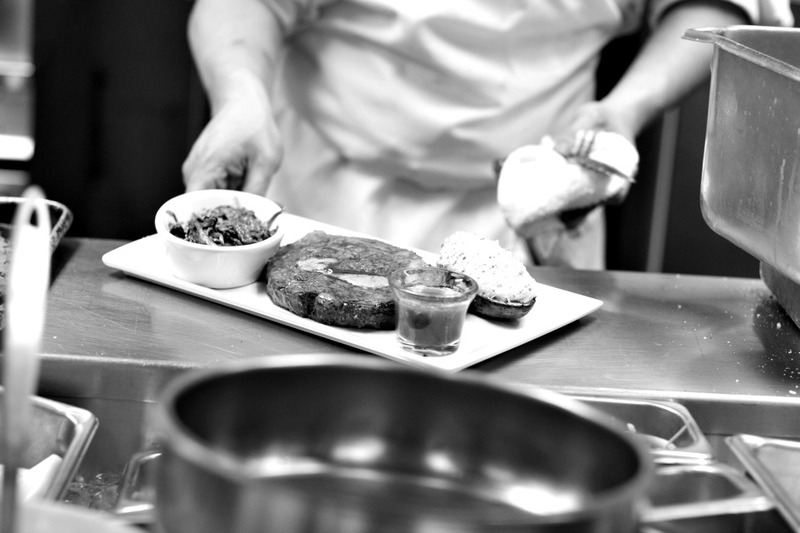 Chef Chris is an amazing member of our team who helps us put our best culinary foot forward. Sheer quality will always be the proverbial proof in the pudding. All the finest things are handcrafted, hand-selected and thoughtfully procured—whether it’s a bespoke tailored suit, a cashmere shawl or a world-class dinner. The subtle touches of quality and skill that go into these items are what make them so special. This is exactly the kind of care that you will find when you visit any of the restaurants at The Desmond. From hand-carved beef tenderloin to pristine seafood and well beyond, The Desmond works closely with the best purveyors to get the very best of what’s around! This entry was posted in restaurants and tagged chef calhoun, chef chris, chris calhoun, meet the team. Bookmark the permalink.